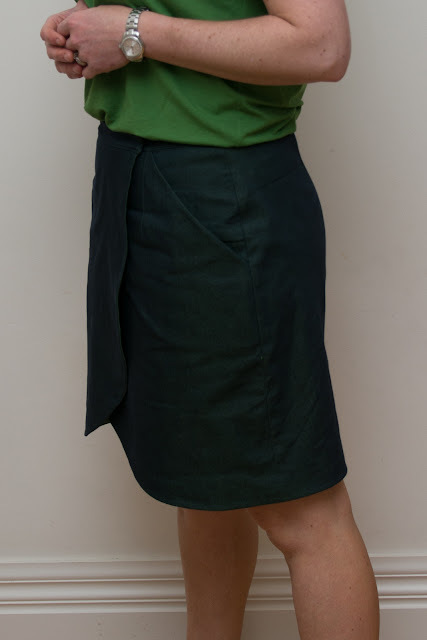 A little while ago I made myself the new Liesl & Co City Stroll Wrap Skirt and I've been wearing it a lot! 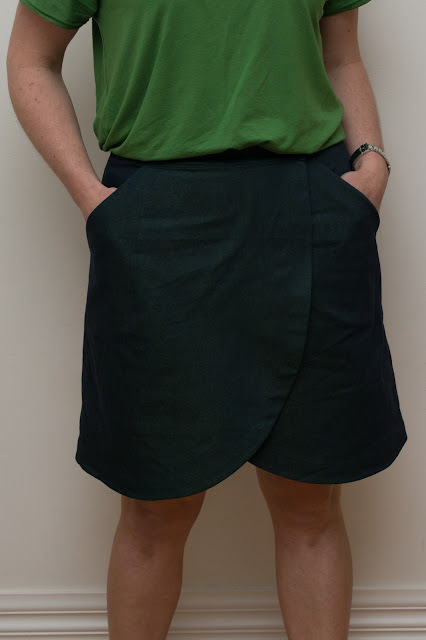 The skirt and I have been getting along very well and I'm over on the Oliver + S blog today showing what you can, and can not, do while wearing a wrap skirt. 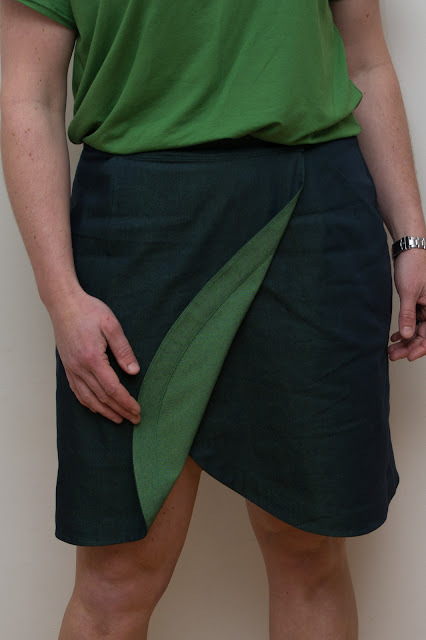 Here I'll talk more about making the City Stroll Wrap Skirt rather than wearing it. I've been on a bit of a bender recently for "one evening sew patterns". That is, a pattern that once you've got it traced off and cut out, can then be sewn in one evening. Now, I'm not quick, and some of those evenings become late nights or even into the early morning, but they still count as one session sews. This skirt is certainly do-able in an evening. I sewed the first version the night before the kids and I went to the ballet to see Cinderella. 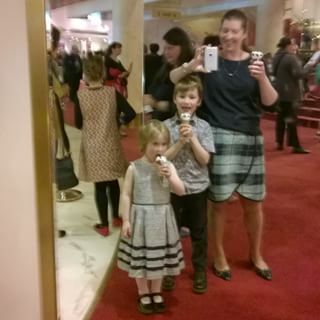 Here we are in a low quality phone shot enjoying our ice creams at intermission, all completely dressed in clothes sewn by me. I bought this cheap cotton plaid from Eliza fabrics ages ago with plans to make another Continental skirt but never got around to it. It was shifty fabric and I knew it needed lining. Partly in order to wear it with tights and boots during winter, but also to stop it from warping out of shape. The pattern has the option of finishing the curved edge with a facing, or using bias binding. I liked the idea of bias binding for what is effectively a blanket skirt. The lining should have been as easy as making a second skirt, putting both under the waistband and then binding the hem. I got it into my head that the skirt and lining needed to be attached at the side seam to help prevent sagging of the main fabric. If only I'd thought about it before hand I could have used Nicole At Home's fabulous tutorial for a Hong Kong finish. Instead I sewed the skirt darts and the lining darts, then joined the skirt and the lining together with 1/4" seams (half the seam allowance) turned it right side out then joined front to back with 1/4" seams. It works as a nice, neat finish and holds the skirt in shape well, but the seams are a little bulky compared to a proper Hong Kong finish and don't lie as flat as they should due to being so narrow. Next time I'll try to remember to do it properly and do it Nicole's way. If I hadn't baffled myself with my dodgy lining by this stage then I might have properly understood the closure instructions. The skirt should have an invisible closure with buttons sewn on the inside of one overlapping waistband and the buttonholes on the underneath waistband. It was late and my navy button were looking pretty similar to a navy size 20 snap so I saved myself the task of sewing buttonholes and went out to the shed and popped four snaps in. Done in a few minutes. But done back to front and the wrap is technically the wrong way. Size: 14 with 1" extra length added. Over the course of a day it starts to feel a bit stretched out and loose. Probably more due to the fabric, but I decided I wanted another, and this time went down one size. This one is size 12, again with 1" extra length and is a firmer, neater fit. The fabric is a kind of shot denim if such a thing exists. It has the weight of a lightweight denim, a small amount of stretch, and is navy with this lime green sheen and underside. To show off the green, I finished this one using the facing. Curiously though, the skirt almost never flaps open like regular wrap skirts do. It would take a strong wind, or a particularly spectacular leap for the Frisbee for anyone to see the inside of my skirt anyway. And the back darts had this size fitting me just perfectly with no adjustments (that I don't know how to do anyway) needed. Because the waist was fitting nicely I did get this one to wrap in the correct direction and put some sew in metal snaps and a skirt bar and hook in for the closure. I'm very happy with this skirt and when summer eventually comes I can imagine I'll wear it as much with bare legs as I'm wearing the other one with tights now. 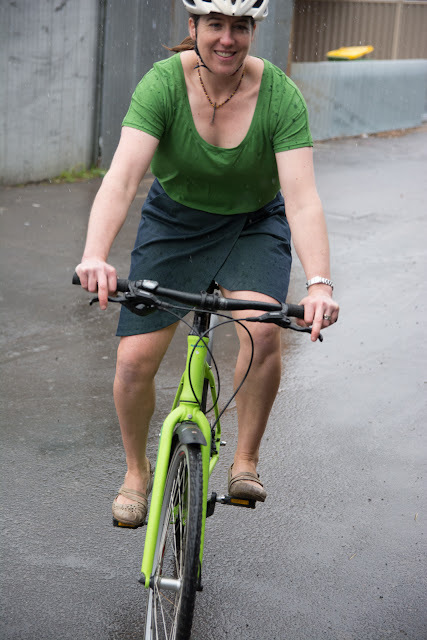 I'll tell you more about my tops another day, but check out how nicely my bicycle co-ordinates with my outfit! And yes, I probably have enough bicycles that I could colour match on almost any given day of the week! Handbags on the other hand are a choice of two, either black or brown. Priorities my friends! Edit: It's just occurred to me I made a mistake with my first skirt that probably explains why it was a bit big. I was in automatic mode and thought "I know all about sewing bias binding after knocking off that Little Things To Sew book" so I bound the edge. I wanted the binding to show so it was a design choice, BUT I forgot to trim off the seam allowance. Your skirts look great, Shelley. That two-sided denim is fantastic! I was looking at this pattern just the other night, wondering if I should try sewing it or if it would meet the same fate as my dreadfully unflattering weekend getaway dress (aka 'the sack'). This style definitely suits you, though. And it's good to know that the skirt doesn't flap open! THanks Marisa. I know the fabric is still available as Nicole (Mother of 5) sent me a message from the fabric shop saying she'd seen this exact fabric and thought my son might like it. Already bought for that purpose and already reassigned to some selfish sewing was the answer! This skirt is definitely fitted compared to the loose Weekend Getaway. Totally different beast. I like your skirts, and am impressed you ride in one. I'm not a frock or skirt lass at all. I only have two bikes - cargo & tourer - but have several panniers & bags. Haven't yet found the perfect one! Thanks! If I'm "going for a ride" it's lycra head to toe (and the toe covers have been in use in this freezing weather!) but to do the school run I need to ride in whatever I'm wearing for the day. much easier if all my clothes are bike friendly. If I get good at fitting pants then I'll make those, but skirts and dresses are so much easier to fit, so they're my me-made staples for now. If cargo carrying and touring/commuting is what you do, then you may have the correct number of bicycles. For me the correct number seems to be N+1, where N is the number I currently have! Wow, thanks for referencing my tutorial! 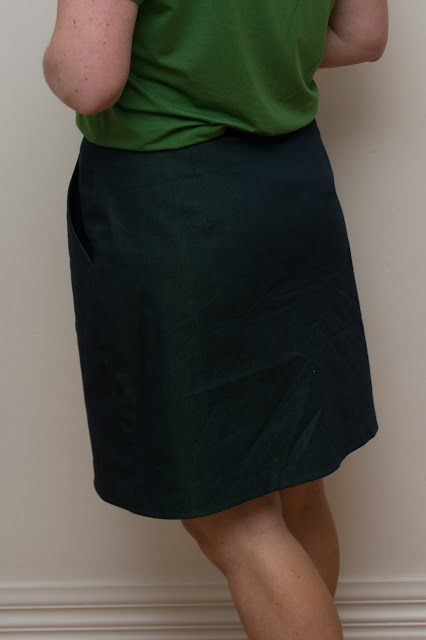 I bought this skirt pattern for work wardrobe in the Fall, great to hear it is as lovely as I had hoped! I hadn't even though of lining it with the Hong Kong finish (okay, I haven't thought about the pattern at all since I bought it), but I'm totally doing it. I LOVE your plaid version--well done!